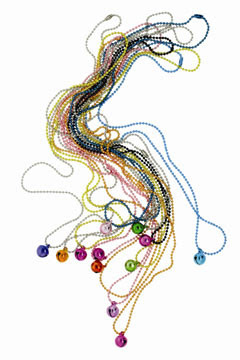 London-based jewellery brand Allumer has a diffusion line called Allumette comprising simple multi-coloured ball chains with tiny neon-coated aluminium bell pendants. Initially designed as a friendship charm for her friend, founder Natasha Leith-Smith has created the range of delicate necklaces in various bright colourways, which look great worn layered in clashing colours or on their own. I received the black bell/ silver chain necklace at Elise Machnik's collection launch in Mayfair, I was given the orange bell/ baby pink chain combination and then I got the green bell/ purple chain version earlier this week at London Jewellery Week and they look great together!